After about a month away, I am back and ready to blog. School started back up, and I needed to be focused on a new batch of kiddos. Now, I am ready to share some of the nail designs I have worn for the last couple weeks. I used Sally Hansen Xtreme Wear Blue Me Away for the base. It looked this good after one coat! Then, for the cookies I used Sally Hansen Insta-Dri Quick Sand, and the chocolate chips I used Sally Hansen Complete Salon Manicure Branch Out. To paint the cookies and chocolate chips, I used a dotting tool. 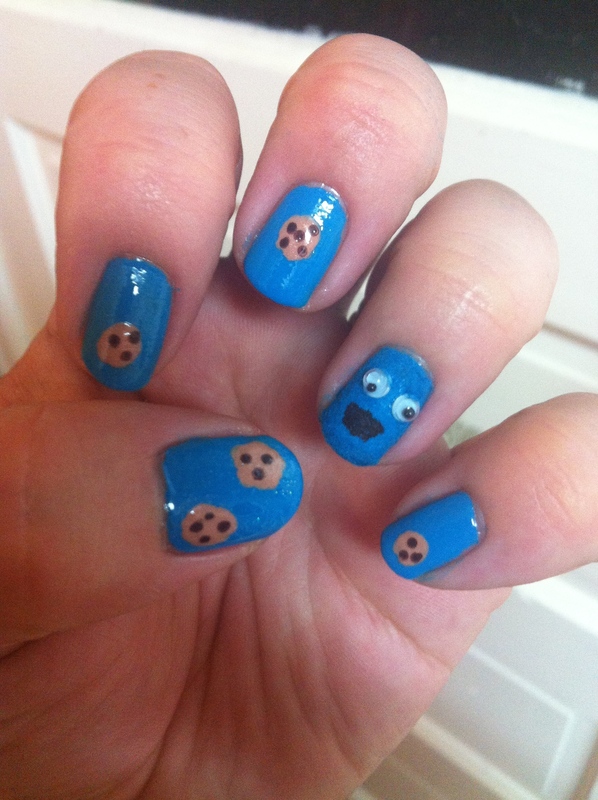 For the Cookie Monster nail, I put blue flocking powder on to make him furry. I just used a Sharpie to draw in the mouth. Finally, I used google eyes so they would really move around like Cookie Monster’s. I had my concerns going into this design. I wondered if the flocking powder would look gross after a day of washing hands, doing dishes, showering, lotion…you get the drift, but it didn’t. It would stay wet for a couple minutes and then dry out, and you’d never know the difference. I also was worried that the Sharpie would bleed, but that didn’t happen, and the eyes did not fall off. I wore these for six days before I removed them. As a teacher, these were a hit. But honestly, I got tons of compliments on them from strangers when I was out and about. One, I don’t think they look too shabby. Two, who doesn’t love Cookie Monster? This design was surprisingly simple, and makes me wonder about other uses for google eyes (Halloween monster nails?) and the flocking powder. Have you used these things much for anything? Let me know! Once again, I am excited to be back!